One school in Chorley said it did not have enough space for its pupils - another claimed to have room to expand. Two Chorley primary schools just a mile apart from each other have been refused permission to change how many pupils they admit - even though one wanted to take more and the other fewer. Highfield Primary School requested a reduction in its reception entry from 45 pupils to 30, while Duke Street Primary asked to grow its intake from 50 children to 60. But education officers ruled that changes to Highfield’s numbers would result in a shortage of places in the area - and they were not satisfied that the Duke Street school had sufficient space to accommodate extra pupils. Lancashire County Council’s cabinet accepted their recommendation and refused the requests. Despite their close proximity, there is no significant overlap in the catchment areas of the two schools. Responding to a consultation on its proposed admission numbers from September 2020, Highfield had claimed that it “lacks the physical space for 315 pupils”. “When the school was built, pupils did not have iPads [or] laptops. The school also lacks storage facilities as every spare space is used for teaching,” its submission notes. The school also pointed out that it was being used to accommodate pupils who had moved into the wider Chorley area, but could not immediately get a place at their first choice school. When they eventually moved to schools closer to home, this led to the disruption of friendship groups and had a “detrimental impact on their attainment,” the school claimed. Duke Street Primary had told education bosses that it had “sufficient room to begin the process of becoming a 2-form entry school”. In its consultation response, the school said that it wanted to rearrange some of its space to accommodate the change. But officers rejected the proposal, until there was “more certainty about the available accommodation”. Speaking after the meeting, the headteacher of Highfield Primary, Andrew Proctor, said that he understood the county council’s view and “appreciates the need for places in Chorley”. However, he also appealed for help to make the school more suitable for the number of pupils attending it. “We hope that the authority will support the school in improving the building and ensuring that it is fit and safe for the number of children so that those that come are not at a disadvantage,” Mr. Proctor said. 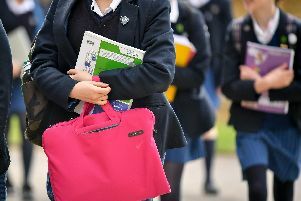 In a statement, Lancashire County Council’s cabinet member for schools, Susie Charles, said: “The county council has a statutory duty to ensure that we have the right number of school places and our officers have a very good track record of doing that. We use a range of data to plan, based on historical levels of population growth, migration and other factors. "We produce a School Place Provision Strategy and this informs us of the numbers of children attending our schools, together with the projected impact of new housing developments that are planned for the next five years. "Chorley continues to evolve and grow, and we will monitor this situation on an ongoing basis to make sure we continue to provide the best service we can." County Hall rejected all six requests which it received from primary schools to alter the proposed number of pupils entering their reception classes from next year. Duke Street Primary School was contacted for comment.